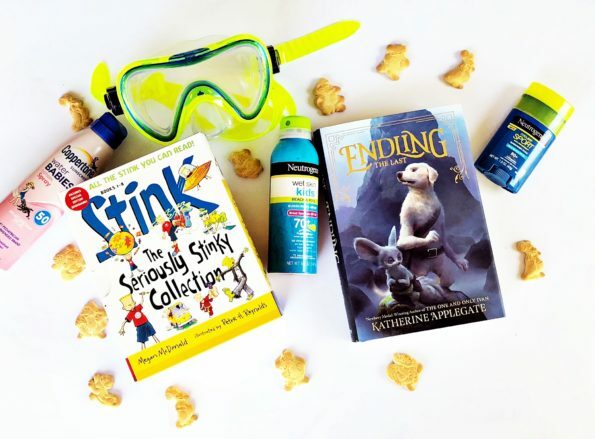 What My Kids Are Reading: End of School Gift Edition! The school year (in Texas) is finally over and we are more than ready for summer! Well, maybe not the heat, but we’re ready for fun, summer sports, and, of course, reading for fun every day. Every year I like to give my kids a few fun outdoor toys to celebrate the last day of school and I always include a couple of books as well. (And as you can see, I also stock up on sunscreen-that’s about 10% of our current supply . . .) It’s a little harder to buy books for my kids now, because they really like to choose their own, but I think I picked some that fit their reading personalities, and they were excited to get started on these! I picked this series out for my 7-year-old. He loves being read to, but when he reads to himself he always goes for funny books. Captain Underpants, The 13-Story Treehouse, Galactic Hot Dogs . . . you get the idea. This series is written by Megan McDonald, the author of the Judy Moody series, and it’s about Judy’s younger brother, Stink. They’re beginner chapter books, and Stink kind of reminds me of my 7-year-old: a good kid who somehow gets into trouble, has a bossy older sibling, and loves being silly and funny. There’s a also a comic strip written by Stink within the books, which is a great addition if you have a kid who loves graphic novels. My 7-year-old has already finished the first book and is ready to read the second and he loved it!! As in, he chose to sit and read this book over playing with race cars at his big brother’s basketball practice. I’ll be buying the rest of the series as soon as he finishes this set! I had no idea that Katherine Applegate had a new book out, so I grabbed this up the second I saw it. When I saw that it’s the first in a new series, I got even more excited-my 9-year-old and I love series, and this one sounds perfect for him. My 9-year-old really likes reading books with a lot of adventure, peril (of the kid-friendly variety, like Harry Potter and Percy Jackson), and relatable characters. This series sounds exactly right for an adventure-loving reader. The series is about a group of fantastical animals who behave like humans. One in particular, Byx, believes she is the last of her kind and sets out on a journey to find a new, safe home, and to see if she can find any more of her species. Along the way she gets into trouble, but also finds allies and uncovers some secrets she wasn’t planning to find. It honestly sounds amazing, and I might read this one to my 9-year-old . . . because I want to find out what happens to! It feels a little bit like Narnia and The Golden Compass series too, so I would suggest this for fantasy lovers as well.